This entry was posted on Saturday, May 8th, 2010 at 12:14 pm and is filed under Family, Sarayu Yoga. You can follow any responses to this entry through the RSS 2.0 feed. You can leave a response, or trackback from your own site. « Come along! Find your nesting spot. In May of 2008, I blogged about my last Can O Worms cleaning. Obvious that it was time once again, I set aside time to complete the chore today. It has now been eight years that we have been vermicomposting. 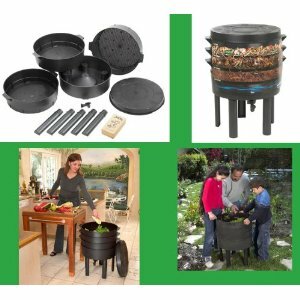 It seems like a natural part gardening to compost and to vermicompost. Our garden benefits, but it still remains a chore I put off until the very last moment (that means before the weather gets hot). I have to say I am glad to be done, cleaned up and ready to wait for the next two years before I need to do this again. I reaped about 25 lbs of the black gold which should last a good long time. I think my husband will be taking over the worm patrol going forward. He is retiring in June and will have more time to fuss over the worms. Not that these simple creatures really require much fussing. Perhaps he will come up with a way to make the cleaning/collection part of the process a bit easier.